CHS Football Cards came as close as possible to letting one slip away (to Skiatook) but TJ Johnson' catch of a 10 yard Shawn Loscheski pass with no time remaining gave the Cards a 34-32 win. "It ain't over til it's over" were Coach Jones' words to the jubliant team afterwards. Photos later. 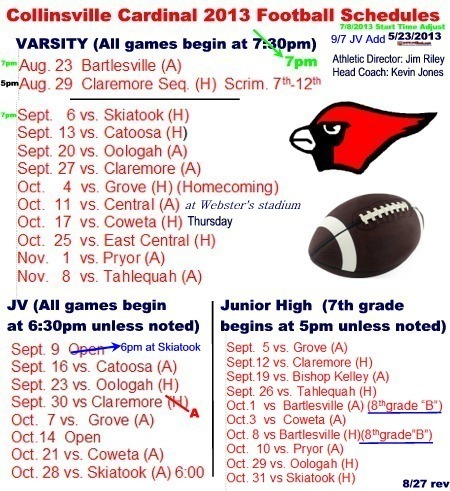 -- Ted 10:05pm Friday 9/6/2013 -- (The winning catch photo is now on the intro page 10:15pm) Skiatook had gone ahead for the first time with a TD and extra point with just 44.7 seconds left in the game ... before Collinsville pulled off their quick miracle. Collinsville had a 28-10 lead at 3:44 in the 3rd before Skiatook roared to the lead at 28-31. Two long Shawn Koscheski keepers (64 & 68 yards) gave the Cards their first two scores. Then Koscheski TD passes to Tyler Forrest and TJ Johnson got the Cards to 28 ... before the final non-timed play following a Skiatook penalty which ran out the final 15 seconds as they tackled a Collinsville receiver before the ball got there allowing an interception and runback that was all called back. Collinsville was trailing 28-32 and the clock was full of zeros but a Skiatook defensive penalty gave the Cardinals one final chance from the 10 yard line. T.J. Johnson (#6) hauled in this TD pass from QB Shawn Koscheski to put Collinsville back on top and a season opening win. Skiatook had taken their first lead in the game leaving the Cardinals just the final 44.7 seconds to work with: Ryan Haymaker ran the kickoff out to the 49; a Keenan Hamilton pass reception reached the 35; a Dylan Cook pass reception got the cards to the Skiatook 18 with about 15 seconds left. The next Shawn Koscheski pass was picked off (after Keenan Hamilton was practically tackled on his pass route before the ball got there with flags flying everywhere) and run back to the other endzone burning that final 15 seconds. The officials brought the ball back giving Collinsville one untimed play from the 10 yard line which they cashed in for a 34-32 win. Shawn Koscheski (#1) was Collinsville's quarterback for the entire game and started the scoring with this 64 yard run with 7:56 left in the first quarter. He also tallied Collinsville's 2nd TD on a 68 yard keeper to put the Cards up 14-7 on the first play of the 2nd quarter. Collinsville was facing a 3rd and ~25 on their first possession when Koscheski took off (above) and ended with the TD run (left). Dylan Cook (#18) intercepted this Skiatook pass at the 1 yard line after Skiatook had intercepted on the previous play with the score at 7-7 with ~3 minutes left in the 1st quarter. Cole Keim (#67), Chris Kallin (#54), and Kutler Cole (#60) are the identifible blockers in this photo as Ryan Haymaker (#25) moved Collinsville out to the 10 yard line after taking the Shawn Koscheski (#1) handoff following the 1st quarter Cook interception at the one yard line . Tyler Forrest (#81) caught this 31 yard Shawn Koscheski TD pass at the 4:58 mark in the second quarter to put Collinsville up 21-7. Skiatook kicked a field goal as time expired on the 1st half for a 21-10 halftime score. Collinsville led 28-17 with just over 9 minues left in the game (above). Skiatook had just intercepted in the endzone to stop a potential Collinsville score. Skiatook then drove 80 yards to tighten the score at 28-25 with 6:27 left in the game. Brandon Lowe (#2) took this Skiatook punt on the run early in the 3rd quarter but got only a step or two before being leveled. Senior Colton Connover (#53) was was of the many Cardinals enjoying a few moments with the Highway 20 Bowl Trophy which Collinsville has won all three years since the tradition with Skiatook began.